Plow (pluh). The most important farm implement for working the soil in preparation for planting. The first plow was no more than a digging stick pushed or pulled to break the surface of the ground. In Ukrainian territories the plow evolved over many centuries through the same stages as in other countries. During the 1st millennium BC and the first few centuries AD the wooden plow (Ukrainian ralo) was widely used among the East Slavs. It consisted of a wooden draft beam, to which a draft animal was tied, a wooden (later iron-tipped) share beam, which cut into the soil, and a tail handle, which the plowman used to control the motion of the plow. Unlike later types of plow the wooden plow merely cut the earth without turning it over or breaking it up. The furrow it produced was symmetrical, narrow, and shallow. Because of its lightness and the shallow incision it made the wooden plow could be drawn by one or two oxen or horses. 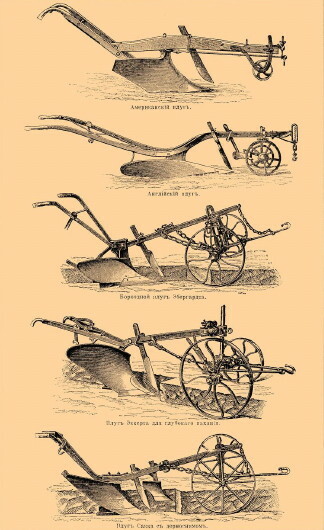 The true plow, which is characterized by its ability to undercut and overturn the soil, appeared in Ukraine only at the end of the 17th century. In addition to an iron share it possessed an asymmetrical moldboard which turned the soil over and pushed it to one side. The addition of wheels made for heavier plows that were capable of working the heavier and deeper chornozem of the steppe. The introduction of the tractor made still larger and heavier plows possible. The first serial plows in the USSR were built in Odesa in 1925. Today plows of different construction—disk, chisel, rotary, combination—are adapted to various soils and special functions.